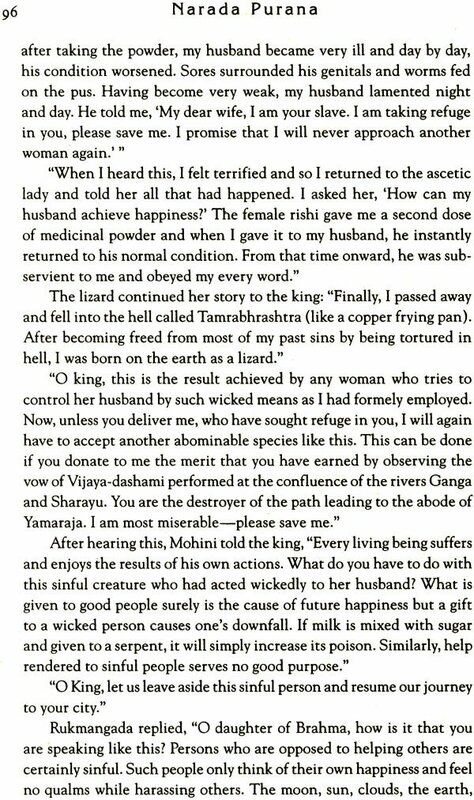 This is the second in the series of maha-puranas, told in story form. In the Shrimad-Bhagavatam, Canto 12 chapter 7 verses 23 and 24 it is stated: The eighteen major Puranas are the Brahma, Padma, Visnu, Siva, Linga, Garuda , Narada , Bhagavata, Agni, Skanda, Bhavisya, Brahma-vaivarta, Markandeya, Vamana, Varaha, Matsya, Kurma and Brahmanda Puranas. The Narada Purana is not as often quoted by the Vaishnava acharyas as most of the other Puranas. In Shrila Prabhupada's books, only one quota- tion is found as follows, in the purport of the Shrimad-Bhagavatam, Canto 10 chapter 16 verse 57: Commenting on this verse, Srila Madhvacarya has quoted the Narada Purana as follows: "From Hi- ranyagarbha, Brahma, comes the second creation of this universe, but the universe is primarily created by Visnu Himself. Visnu is thus the primary creator, and four-headed Brahma is merely the sec- ondary creator." 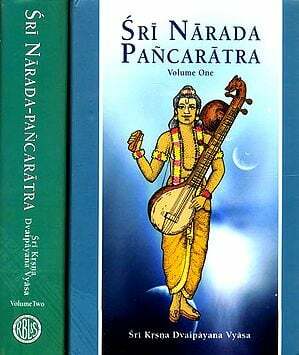 This volume is very small, especially considering the size of the Narada Pura- na, because it is a summary study, in story form. There are not many stories told in the Narada Purana. Most of the book consists of very elaborate descriptions of various methods of worship of the Supreme Lord or the demigods, as well as glorification of various holy places and religious vows. 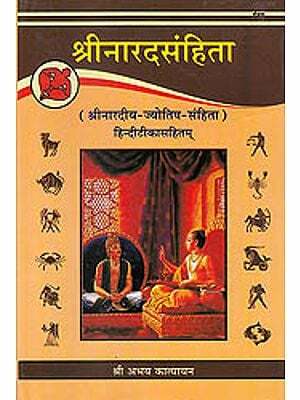 This is the second in the series of maha-puranas, told in story form. In the Shrimad-Bhagavatam, Canto 12 chapter 7 verses 23 and 24 it is stated: The eighteen major Puranas are the Brahma, Padma, Visnu, Siva, Linga, Garuda, Narada, Bhagavata, Agni, Skanda, Bhavisya, Brahma-vaivarta, Markandeya, Vamana, Varaha, Matsya, Kurma and Brahmanda Puranas. The Narada Purana is not as often quoted by the Vishnava acharyas as most of the other Puranas. In Shrila Prabhupada's books, only one quotation is found as follows, in the purport of the Shrimad-Bhagavatam, Canto 10 chapter 16 verse 57: Commenting on this verse, Srila Madhvacarya has quoted the Narada Purana as follows: "From Hiranyagarbha, Brahma, comes the second creation of this universe, but he universe is primarily created by Visnu Himself. Visnu is thus the primary creator and four-headed Brahma is merely the secondary creator." This volume is very small, specially considering the size of the Narada Purana, because it is a summary study, in story form. There are not many stories told in the Narada Purana. Most o the book consists of very elaborate descriptions of various methods of warship of the Supreme Lord or the demigods as will as glorification of various holy places and religious vows. Just to give idea of the very intricate rituals outlined in the Narada Purana, I will present here part of the description of how one should offer lamps to Hanuman. Sanat-kumara said, "Henceforth, I shall describe the procedure of offering a lamp to Hanuman. Merely by understanding this, one will attain all perfection". "I shall mention the size of the lamp and the vessel, as well as the amount of oil that is to be used. I shall tell you the mantra to be considered the bestower of all desires." "Mustard seed oil is conducive to the destruction of ailments. In the activities of killing, the oil extracted from white mustard is useful. Gingelly oil is considered conducive to the acquisition of prosperity, and it is also used as an offering for the arrival of a traveler. In the activities of ostracizing, the oil from the karanja plant should be used. (The list of various oil for various purposes goes on and on)." "Wheat, gingelly seeds, black gram, green gram and rice. These are the panchadhanya (set of five grains) used for the purpose of nityadipa (a Permanent lamp) for the worship of Hanuman, the son of the wind-god." "Thereafter, the pure devotee, with a fully controlled mind, should make the vessel of the lamp. When the lamp is lit in the vessel, the devotee should read the kavacha pertaining to Hanuman. After placing the lamp on the clean ground, it should be lit on a Tuesday. One should make as many threads in the wick as there are syllables in the mula-mantra, accompanied by the name of the sadhya (the person for whose purpose the ritul is intended)". "For offering lamps to Hanuman, red threads are considered best. In rites regarding hatred and Killing, black threads should be used. (For various purposes, different colors of threads in the wicks are recommended.)" "In the performance of daily rituals, the amount of oil used in offering should be six palas (a unit of measurement). The lamp should be offered at six places: near the Deity of Hanuman, in the temple of Lord Shiva, at the place where nitya and naimittika rituals are performed, in front of any other deity, at any other place of the devotee's choice of he is afflicted by ghosts and spirits, and where four roads meet." "When offering a lamp to Hanuman, I am describing whatever is especially liked by him". 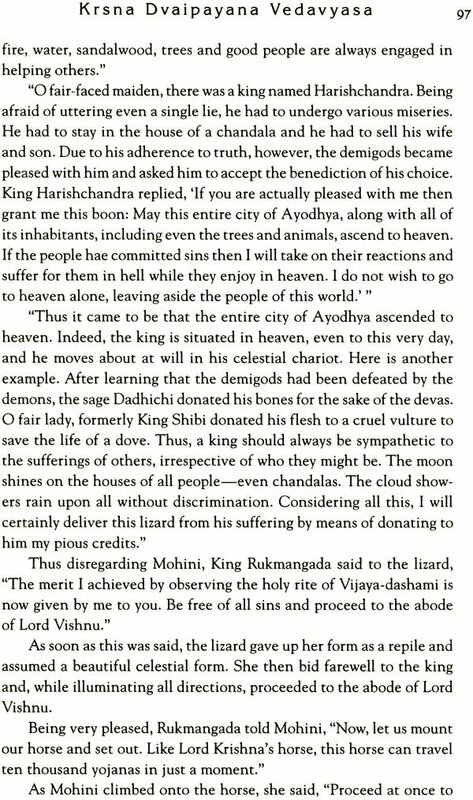 Anyway, I have presented this excerpt just to give an idea of how complex and detailed the rituals of worship that are advocated in the Narada Purana are. My interest is just to present the stories of the Puranas, as well as the accompanying wisdom displayed by the story tellers. While writing articles for Back to Gadhead magazine, devotees have refereed to several stories in the Narada Purana, including eh carving of the Deities of Lord Jagannatha, Baladeva and Subhadra by Vishvakarma, and the story of how Narada Muni became the gopi Naradi, so that he would be able to understand the conjugal pastimes of Lord Krishan. I know that everyone loves a good story. There are many fascinating stories contained in the Puranas and so I hope that you enjoy these few that I have presented from the Narada Purana.